And always, you are delicious. 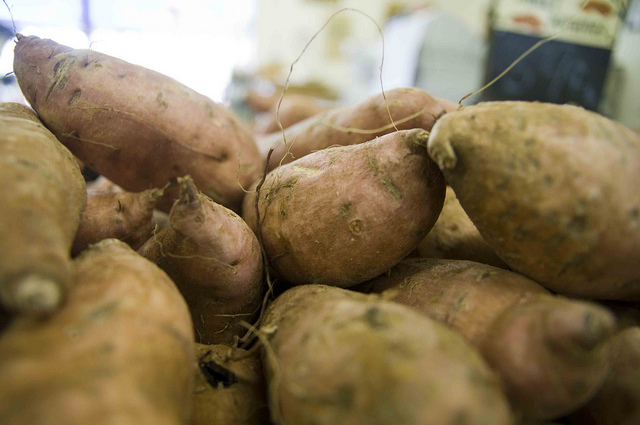 Where are the love songs for the sweet potato? or even eat you plain for breakfast. And you demand nothing of me. You are cheap, hardy, and tenacious. and you somehow become even more delicious. you were largely unharmed and unchanged, and always, uncomplaining. Your sweet deliciousness blossoms through cooking. You are the sweet ground apple of my eye. I found this carmelized sweet potatoes with quinoa and greens recipe while trying to use up some kale, and it’s become a favorite. I’ll admit my kids aren’t the biggest fans, but Nice Tall Guy approves. Keeps in the fridge for several days and makes for great leftovers-for-lunch. My younger sister made mashed sweet potatoes with chipotle chili powder for Thanksgiving one year, and I’ve been hooked ever since. So much more interesting than regular mashed potatoes, in my opinion. Most of the time, though, I just bake a bunch of sweet potatoes at the beginning of the week and use them on salads for lunch or dinner for the next day or two. Delicious! I’m anything but a precise cook, so amounts are very approximate. Toss sweet potatoes with olive oil and salt on a baking sheet. Bake sweet potatoes in 400 degree oven until soft and beginning to brown (20ish minutes.) Flip potatoes half-way through for best results. Once potatoes have cooled, toss with greens, crumble goat cheese and throw in toasted pine nuts. I usually make a dressing with olive oil, white wine vinegar, a dab of dijon mustard, a dash of salt and pepper. Yum! Posted in food. Tagged sweet potatoes. Thanks for letting me get my start in your kitchen (via pb&j sandwiches, marshmallow cakes and lots of messes!) xxoo.